The Boxer Dog - the canine clown. Are you looking for a family dog and friend. A dog who will be unswervingly loyal, affectionate and great with kids. Playful yet alert, protective but not aggresive? If so then a Boxer might be the perfect dog for you. If you are looking for a guard dog, an outdoor dog, an aloof and self-sufficent dog, then the Boxer is not for you. They crave attention and are not physically suited to extremes of temperature so do better as indoor family pets. Though they can look impressively 'butch', they are not overly aggresive by nature but with sharp hearing and a gruff bark they do very well as alert dogs. They have boundless energy but if you are prepared to give your Boxer sufficient exercise, he will do just fine in an apartment. As an intelligent breed, Boxers need plenty of mental exercise too and can be destructive when bored. Happily their playful spirits are easy to amuse and they are eager to please their owners. Boxers are in general wonderful with children, though at a top weight of 60lbs or so, you will need to have the Boxers natural bounciness under control around little kids. 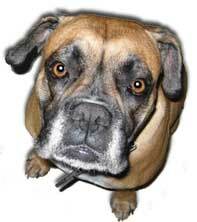 Like most other breeds, the Boxer breed is susceptible to certain illnesses and medical conditions. Boxer Cardiomyopathy is a condition which causes an irregular heart rythm and can lead to weakness and sudden death. Boxers are prone to tumours and cancers. With their very fine coat white boxers and those with large white areas should be protected from strong sunshine to prevent skin cancer. A good breeder will have screened his dogs for all types of genetic disease and the ownership papers will show the pup to be free of inheritable conditions. If you are considering adding a Boxer to your pack, you might want to look at a few Boxer Rescue sites first.